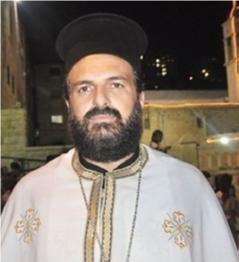 Most Christian Arabs who enlist in the IDF are subjected to scorn and even violent attacks by their Muslim neighbors. The forum not only promotes enlistment and recruits Christian soldiers, but accompanies them through their entire army experience, strengthening them as they stand up to Muslim harassment while working with the army to ensure a smooth acculturation. Thanks to the work of the Forum, the number of Arabicspeaking Christians who enlisted in the IDF in 2013 nearly tripled, increasing from 35 to 100, with another 500 Christians choosing to participate in Israel’s national service. Father Naddaf is especially proud of the number of female recruits who have enlisted– there are even two Christian women officers. 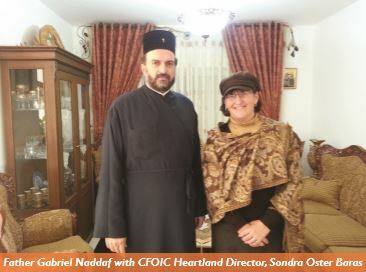 “I believe the Land of Israel belongs to the Jewish people,” Naddaf stated emphatically in a recent meeting in his Nazareth home with CFOIC Heartland’s director Sondra Oster Baras. “If you are truly a Christian and read the Bible you have to believe this.” He is eager to connect with Christian Zionists from around the world and Sondra has promised to help facilitate these relationships.